The purest water in the world is an organic essence, always biologically correct, and perfectly filtered. Natural swimming pools maintain water quality by mimicking the master. Absolutely no chemicals are needed with properly engineered biofiltration and oxygenation methods perfected millions of years ago by Mother Nature herself. And in doing so, these organic pools become a self-contained eco-system. Each resident and element in natural pools are important players in making clear, pure water what it is. An elixir created by an intricate and complex set of biological factors impossible to produce in any other way. Natural pools are as much a habitat for wildlife and aquatic plants as they are a welcome spot for cooling off and exercising in a safe, organic environment. This is a chemical-free pool filter! Swimming in a natural pool is far better for your health and enjoyment than splashing around in poison. In case you haven’t heard, traditional swimming pool water is laced with carcinogens and other toxic things. Chlorine itself is a poison. Its purpose is to kill living organisms. Why do you think it’s added to city water supplies? The stain removal powers of chlorine are secondary. Consider what happens when natural fibers are allowed to soak in it too long. It eats them! Yet, everyone thinks immersing yourself in it is fine. Kids spending hours in pool water is a perfectly acceptable summer-long activity, but it shouldn’t be. Extended contact can cause skin irritations. Chlorine strips natural oils, excessively drying out hair and skin. And when you add chlorine to water other chemicals are produced by its reaction with hydrogen and oxygen (H20). The fumes rising off the pool is actually gas. Along with triggering asthma, they irritate your eyes and lungs for a reason. The gasses are harmful, especially with an indoor pool. Further chemical reactions are created from other things added to pool water. Consider everything all swimmers had on their bodies when entering the water. Makeup, sunscreens, and lotions, hair products, deodorants… the list of chemicals these contain is endless. They wash off! The traditional swimming pool causes free radicals, cancer risk markers in your blood – and all you have to do is spend 40 minutes a day in a chlorinated pool. If you have a pool in the backyard, you might want to think of converting it to be chemical-free. The only way to achieve that is by adding this biological filtering system. A saline pool is not chemical-free – this system creates its own chlorine. And if you’re going to install one in the future, obviously natural swimming pools are the way to go. Besides being far better for your health, a huge help in anti-aging, and better for the environment – they’re far nicer looking. Some people call them a swimming pond or pond pool because that’s what they really are – a pond with a liner that two distinct areas. One of those is a bioremediation feature, making them biosystem ponds. The bioremediation area requires biologically correct engineering to function properly. It must also be the same size as the swimming area. And being shallow, the bioremediation area acts as a solar heater, providing natural pools with water warmed by the sun. This alone greatly reduces the amount of energy needed to keep a pool enjoyable in many locations. The sand, gravel, and plants in the shallows are the water filtering system. The plumbing pulls water from the bottom of the swimming area, forcing it up through the sand and gravel, which removes the larger particles of debris. Beneficial bacteria populates the gravel, breaking down organic debris, and turning it into plant food. Next, the plants’ roots then take care of removing remaining impurities. By the time the water rises to the level that joins the swimming area’s water, it is purified. Several years ago, I wrote an article about natural swimming pools for a builder’s magazine. In the process of writing it, I interviewed a pond builder who specialized in these swim ponds. He explained the bioremediation area as being a reverse bog, relating that the purpose of a bog in nature is to filter ground water before it runs into a waterway or lake. Since we don’t want to filter ground water, but pond water, it has to process in the exact opposite way. And so, the miracle of pure, clean water occurs constantly in natural pools. Adding a waterfall makes natural pools tremendously exciting, but it also helps increase water circulation and oxygenation. Some people add ozone processing to the waterfall spill box with the idea that it sanitizes the water. It’s not necessary. These organic pools are relatively new in North America, but they’ve been in use in Europe for about a quarter of a century. Not just in backyards, but as large public swimming pools. Regular testing of those public pools revealed that the water quality without an ozone system meets or exceeds European drinking water standards. Surely, you wouldn’t think twice about swimming in drinking water, freshly pulled out of the tap. Well, maybe you would in the US where water quality standards are far lower than in Europe. However, it shows you how safe natural pool water is when the bioremediation system is engineered and sized appropriately. And unlike that chlorinated pool, these organic pools take care of themselves. You don’t have to worry about the water pH, chlorine level, or hire a pool boy to keep it clean and vacuumed. Natural swimming pools take care of themselves. Instead of a pool filter, maintaining good water oxygen, so important for plant health and water clarity, is done with an inexpensive water pump and/or waterfall. If the pool is big, both might be best. Add a rock bottom: washed rocks or fitted cut stone. Turn it into a garden pool by planting perennials, ornamental grasses, roses, shrubs, even small ornamental trees, and evergreens around the perimeter. Now you’ve got a landscaping water feature whose value transcends something pretty to look at. You can have two separate swim spaces connected by a stream: shallows for youngsters, and deeper water for laps and diving. You can fit an organic plunge pool in a tiny yard, or have one big enough for a rowboat. Some people add a few fish to their natural pool. Not only are they fun to watch, but their movement is a water circulation asset. Feeding them is easy, they eat aquatic plants and surface skimming bugs. Just add some duckweed to the shallows as part of your clean water filter. The bugs show up without an invitation, as will the frogs. But that’s a good thing – they eat mosquitoes. You definitely want frogs. They are, after all, part of this biological correct habitat. With a body of fresh water in your backyard, you’ll suddenly have more songbirds. Other birds may join them you’ve never seen in the neighborhood before. You’ll also have dragonflies, which are both beautiful and fascinating. In colder climates, natural swimming pools aren’t just a summer activity. They double as ice skating rinks in winter. Some people have a tradition they call the polar plunge – a bracing dive into the pool after it begins forming skim ice. They say it’s an exhilarating experience… I think I’d skip that part! That freshly finished pool might look barren, but give him a couple more summers to add more plants to the bioremediation area and perimeter. He did an incredible job mostly by himself and within his available budget. Natural swimming pools are more expensive to build than traditional pools, but once it’s together, you have no ongoing maintenance costs. Besides adding new plants or fish. Don’t wing it without learning how to do this properly. Find a natural pool consultant to help guide you in engineering and designing your pool. 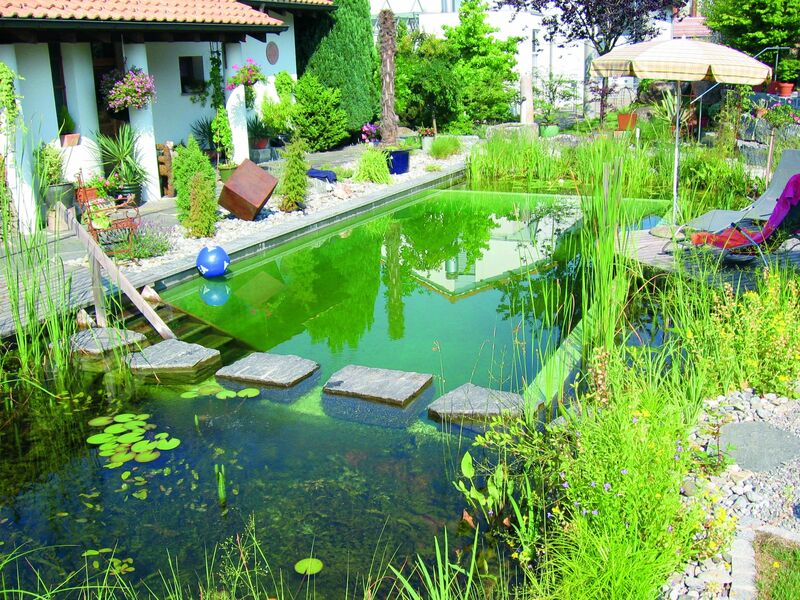 There is one in the UK, David Pagan Butler, whose own natural pool uses only solar energy. He also has a book that will walk you through the entire process, and a movie about it too. As one person in the US discovered in working with him on his pool construction, it’s best to check with the local building codes. While block walls for the swimming area retainer are perfectly fine in Britain, they had to be modified for a natural pool being built somewhere in Georgia. But overcoming issues like this are possible if you can contact someone like David at Organic Pools in Norfolk. He even teaches natural pool building courses. Get his DIY guide is linked below.